Another year gone by. Facing the resolutions. Happy 2016 everyone. High or low resolution count, we work with what we can obtain, not with what we cannot obtain! 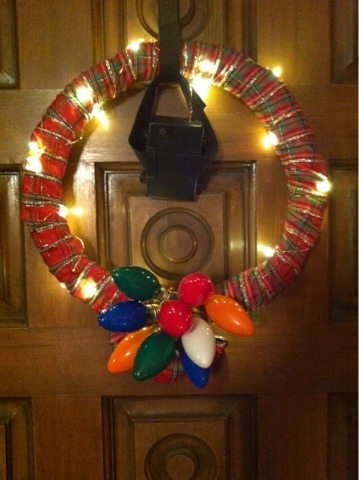 I had been collecting expired bulbs from our Christmas lights with a goal to add them to a wreath. This was the year that I had enough of them. 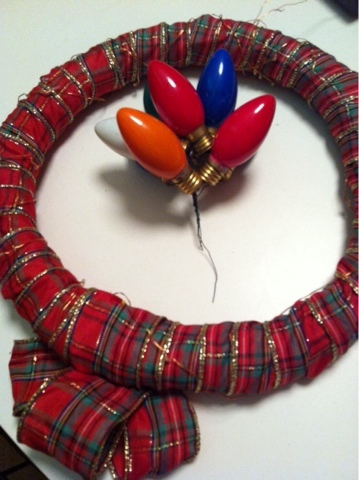 This Cheapskate Tip involves trash (expired bulbs) and ribbon. That's it! 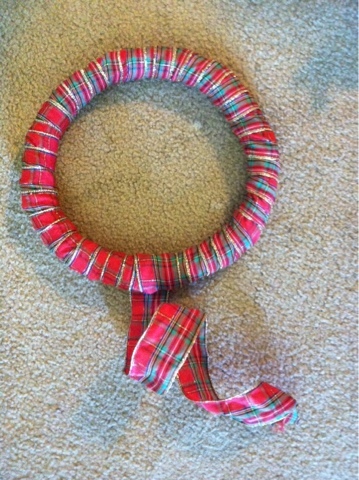 Wrap ribbon around wreath, pinning the beginning and end into the wreath itself. I was partial to the curly ribbon at the end so I let it hang at the bottom. 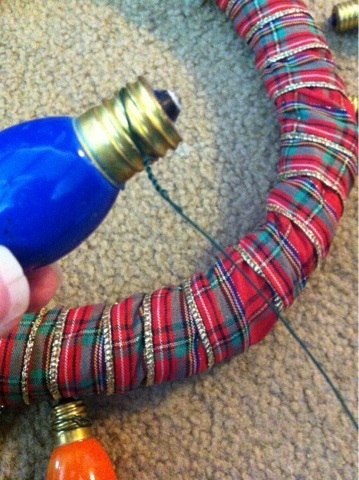 Here, I individually wrapped floral wire around the thread of the bulb and created a hook formation of the wire and poked it into the ribbon and wreath, doing so all around the outer edge of the wreath. Of course, the dog must supervise this effort! ...Not all ideas are fruitful, and this is okay! Lesson learned...back to the drawing board. Instead, I pulled all of the bulbs and twisted the wire together so that they formed a large bunch. 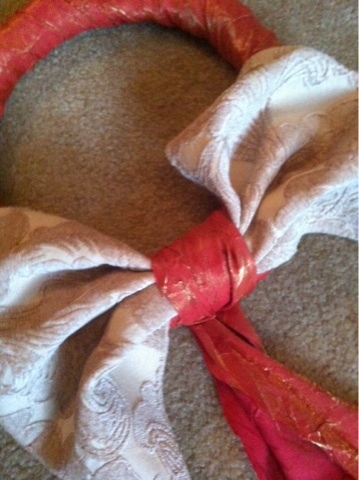 I also decided to take the remaining ribbon and loop it three times at the bottom to create the look of gift wrap. 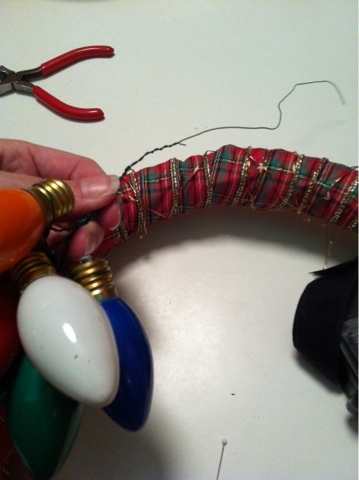 Wrap the bulb cluster wire around the bottom. They are not going anywhere this time! 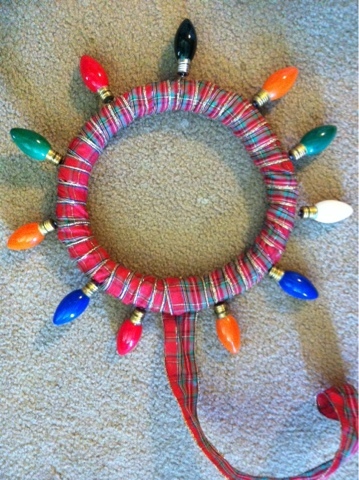 I used a pillow ornament to cover the LED battery pack hanging in the middle of the wreath. This ornament was given to me years ago by a co-worker. I'm still perplexed by its message to this day, but I love it because of its double-meaning! I added a bit more flair above the bulb cluster--red glitter foliage, purchased last year on clearance at a craft store. These little pieces are great for gift wrap too. 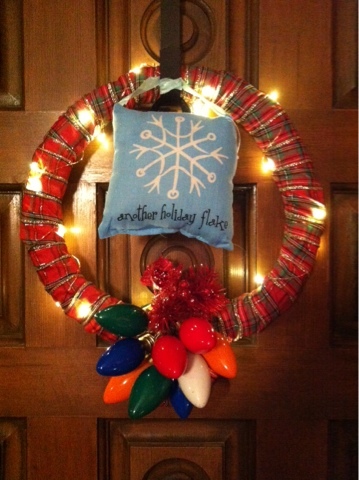 This festive little wreath took longer than anticipated, but hey...not all ideas can be fruitful. Mishaps force us to learn. Mishaps are great opportunities to laugh at yourself. Sometimes even, a better idea can evolve after a mishap. 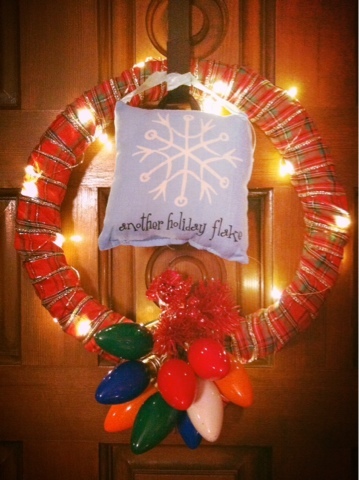 Hoping that your holidays are wonderful, mishaps and all! Happy Thanksgiving greetings, all! Life seems to have surely sped up within the past month and I feel like a can't get a grip. It's unfortunate given that this is the time of year that we need to slow down and reflect on all that we are grateful for. 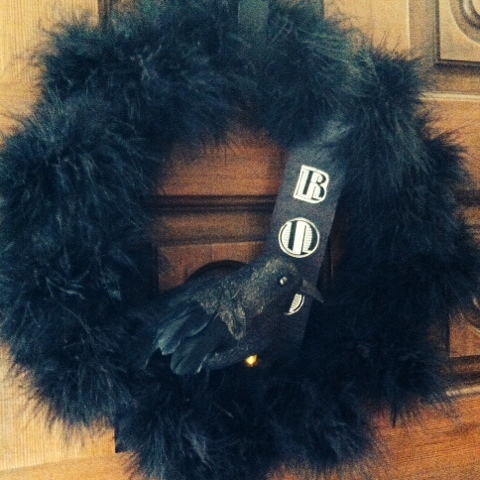 Speaking of lack of time, I wanted to update our wreath to something more Thanksgiving-ish and less Halloween-ish. I had about 10 minutes to do so while dinner was simmering. I (of course) used items I already had laying around, so I'd classify this project as Cheapskate. What else would it be? 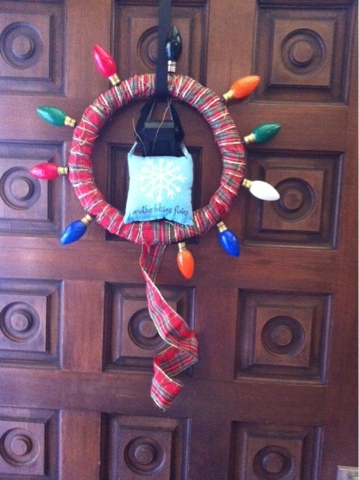 Here's the finished wreath hanging on our door. My camera is really starting to show its age, isn't it? I typically like to construct my Thanksgiving wreaths of colors in orange, beige, and/or gold family. After digging through my scrap fabric, I found this strip of orange silk crinkle tablecloth that would be perfect for wrapping the wreath. Leaving the wreath in its natural state would have worked too. I had plenty of fabric remaining after I wrapped it around one time, and decided it would look cool just to leave the rest hanging. 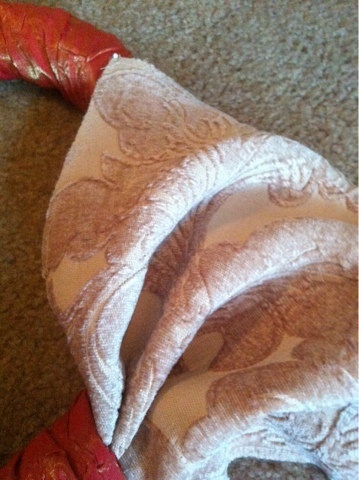 I also found in my scrap fabric bucket a beautiful sample upholstery fabric piece. The beauty in the fabric samples is that most are selvedge-sewn on the edges so they look nice and neat as they are. No sew! Whoo hoo! 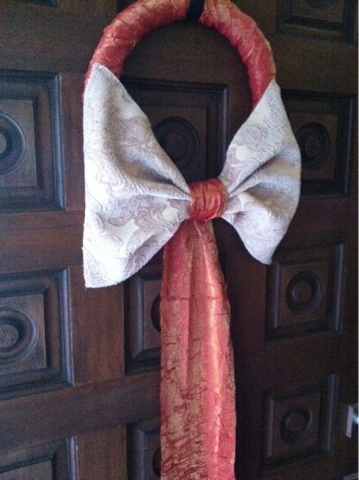 I wanted this perfect square of fabric to transform into an oversized bow. 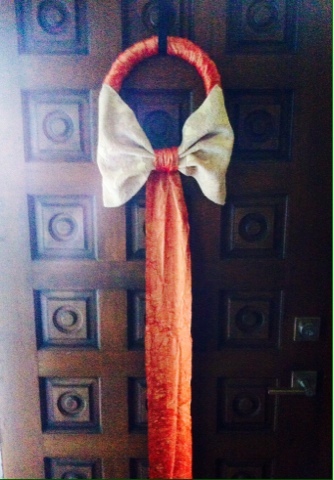 A simple accordion fold and wrapping in the center with the hanging piece of fabric did the job. Oversized bows are floppy. They have to be pinned in place. 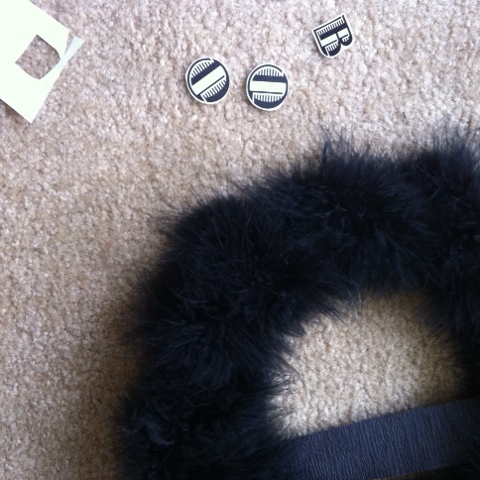 Locate some sewing pins that match your fabric color to discreetly pin the top of the bow corners in place. 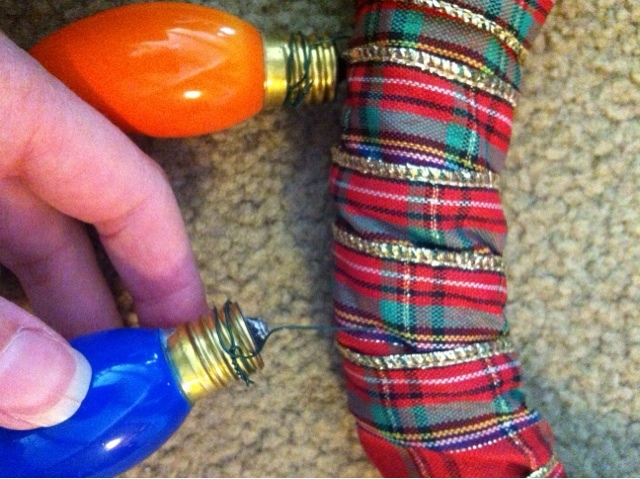 Use another pin to secure the hanging fabric that you wrapped around the center of the bow. Pin in back. 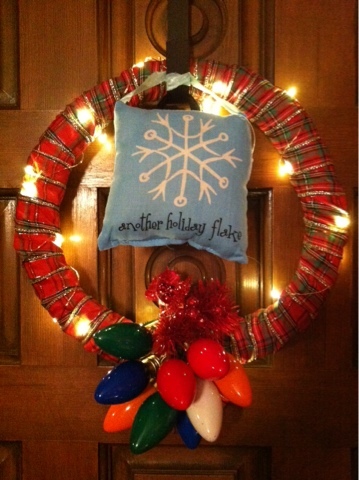 Wreath is complete! Here's to hoping you find a little time to focus on something you enjoy! Happy Thanksgiving! Halloween is around the corner, and it should be epic being that it will be observed on a weekend this year! 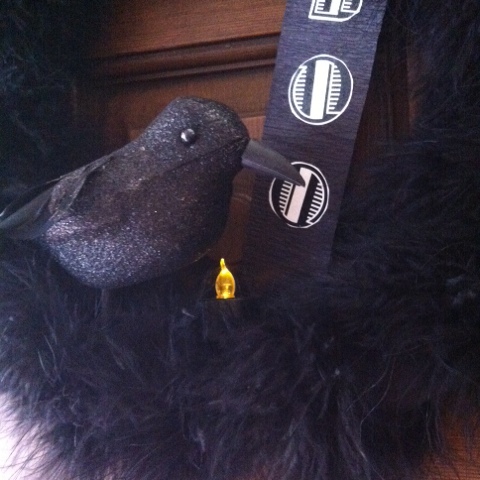 Of course, I cannot neglect the hanging of a spooky wreath to commemorate such a fun annual event. And if you know me, I never follow through with making the same thing twice. 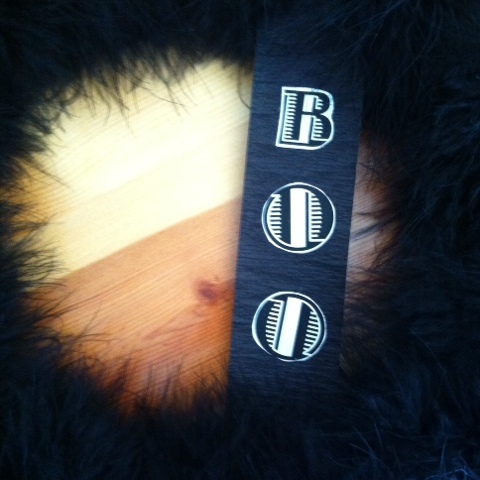 B-o-r-i-n-g. Also, you know this wreath will be of a cheapskate variety. Yep. 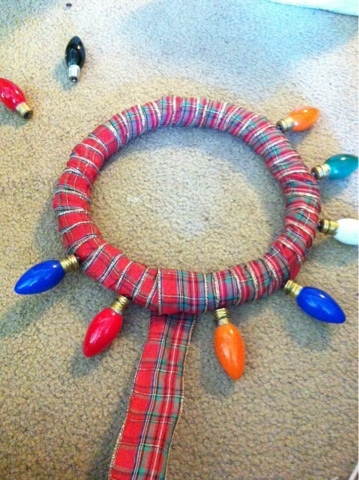 Cheapskate wreath, folks! I wanted all black this year, with a vintage vibe. I was also craving feathers and lights. I wasn't sure how I wanted it to look, but I just begin and let it all flow from there. 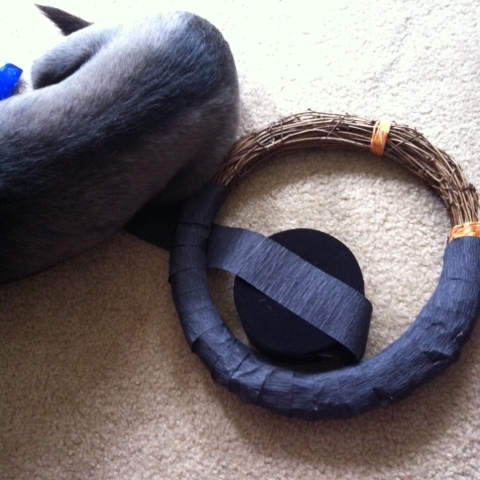 Here is what the finished product looked like, before I strung on the tiny LED lights. Apologies for the sub-par photos. 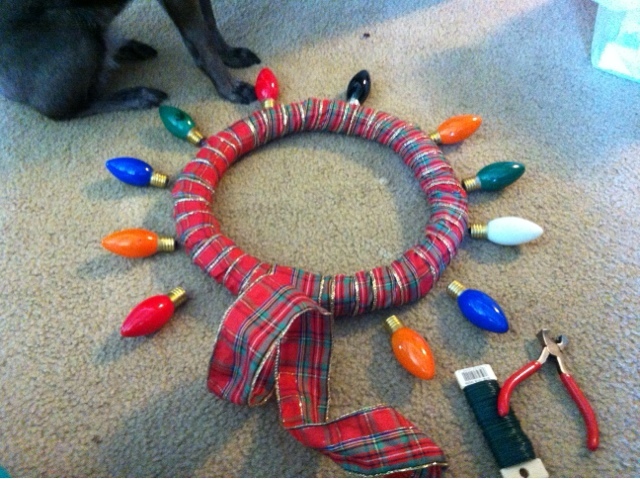 Find the same old scrappy wreath that you use year after year. This project isn't the cheapest Cheapskate Tip I've shared..I admit that I purchased a few things for this one, rather than utilize items I already have in the house. 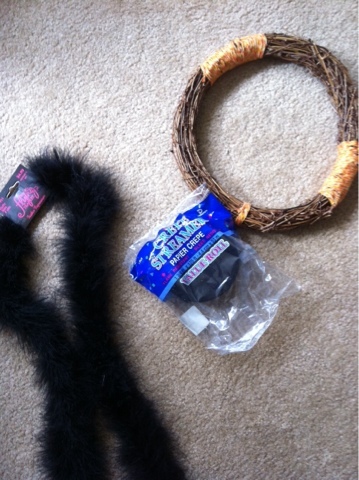 However, the items I purchased totaled $7! There are so many variations that can be made with these supplies too. I divulge in some other ideas below. 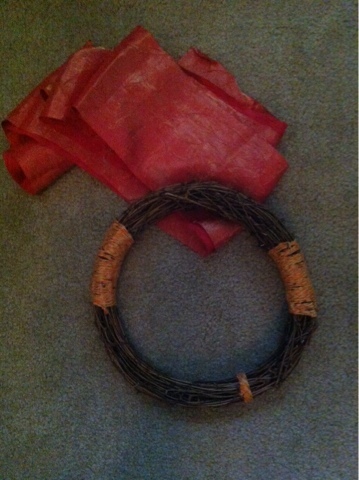 Wrap the crepe streamer around the wreath for full color coverage. Start and finish the wrap with a pin. Stop what you are doing in attempt to get your sweet but attention-seeking house critter off of your project before it rips. Give your house critter the attention she deserves. 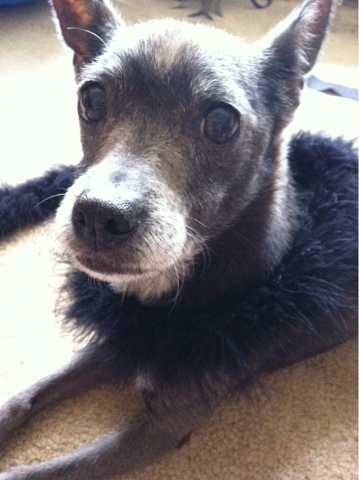 I discovered that my dog looks great in feather boas, and pretty convinced she felt just as glam. Ok, focus. Anyhow, after pinning the crepe streamer, this is where your imagination can fly. I had an extra amount at the end after I cut it, and wondered what it would look like if I pinned the extra across the inside to make a banner for something to be glued on (as pictured above.) At this moment in time, I had no idea what I was going to glue onto my banner. 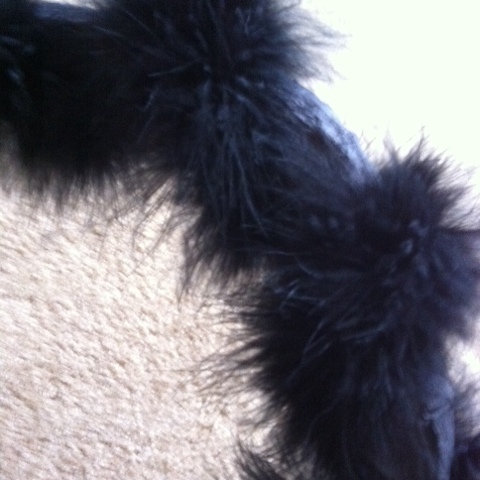 Next, grab your feather boa and wrap it over the paper crepe, cognizant of the the length. 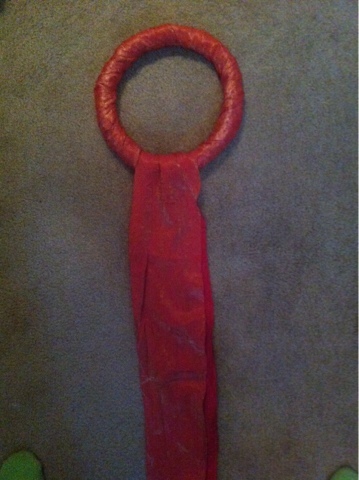 The boa was a much shorter length, so I had to create distance with the wrap. 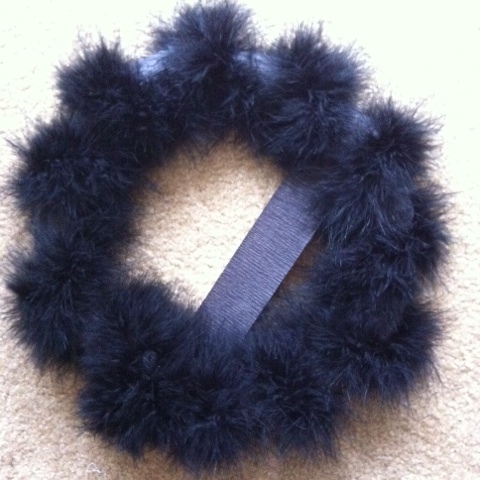 Again, pin the start and end of the boa to the wreath. 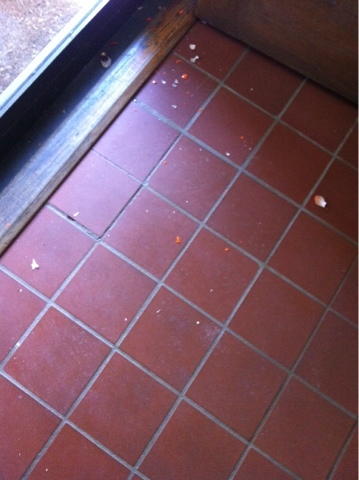 Here's what it looked like. I was loving the texture. I stared at it like this for a while and thought that gluing the word "boo" to the banner is an inexpensive, work-with-what-I-have tactic. I took to my computer and found a font that I was happy with, and arranged the letters in various sizes on one page to ensure one of the sizes would work best. Print page. Cut out the letters. Since the font is black and will be glued on a black background, I cut outside of the letters so that there was a white outline. 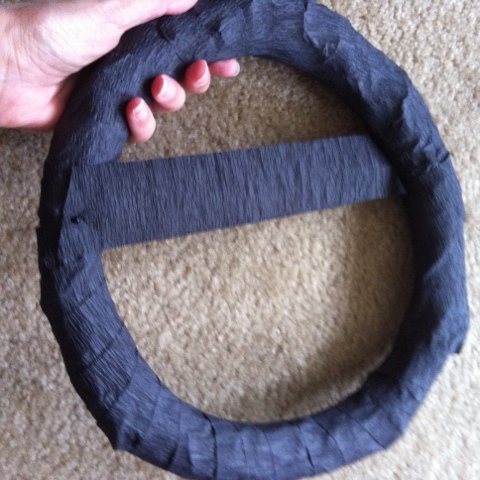 I was not a perfectionist with the cutting, as I felt the more erratic my cutting was, the more creepy it would look. Glue the letters onto the banner with glue stick. Presto. Done. Close-up of the banner. 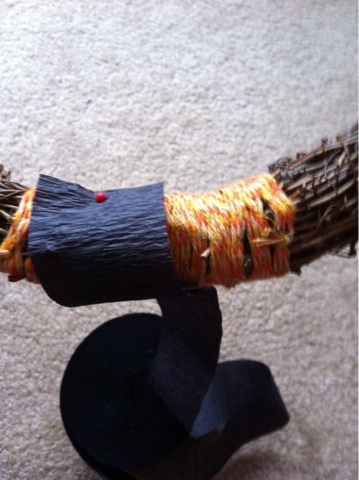 You of course, do not have to opt for the banner, and could make a black flower with the excess crepe streamer. You could cut the excess and not do anything with the crepe. Another option would be to leave several streams of black crepe hanging from the bottom of the wreath to tickle and scare those who pass by. Maybe next year...too many ideas. I felt like my wreath needed something else. I wanted it to be black too. I didn't have anything at home that would work, so I made a trip to the dollar store to see what I'd find. 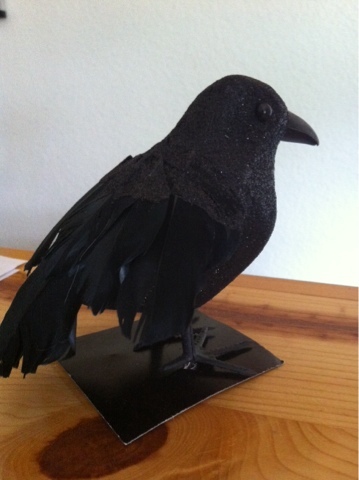 I scored this cool raven for, you guessed it...$1. His feet were already wired underneath so I punctured the wire into the wreath and he stayed put. I wanted illumination next. 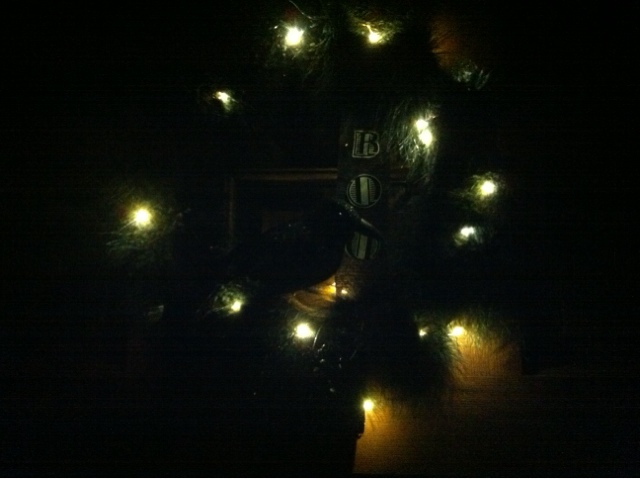 I had this LED "candle" and propped it underneath the raven. It looked okay but I wasn't quite satisfied. I had some LED string lights at home so I wrapped the wreath with the string lights. It looks pretty nice at night, and the tiny LEDs aren't too distracting during the day. What a cinch of a Cheapskate Tip to share this Halloween, and I hope you have a spooky one! Working From Home...The New Compensated Solitary Confinement? Hello all! It's been a while since I've checked in with a blog post. In fact, I haven't had much to say the past couple of months since you have last heard from me. 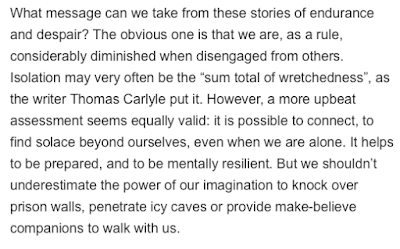 My creative juice is low, and my need to write has been on the back-burner since I find it difficult to sit down to write after 10 hours of sitting down for work. You see, I work from home, and have done so for two years now. I literally crawl out of bed, put on the same pair of house pants and t-shirt, and walk across the hall to my "office" to start the day in front of a computer. Now, before you begin thinking, "how lucky is she?" and "what do you do for a living...I want to sign up for that!" consider this post as a rain-on-your-grass-is-greener-conversation. Not to sound negative, but the public mindset of working from home is quite interesting. The reactions I receive from strangers when I tell them I work from home varies, but for the most part, there is envy. "I LOVE getting dressed up for the office, but instead complete my job tasks on the floor at home. 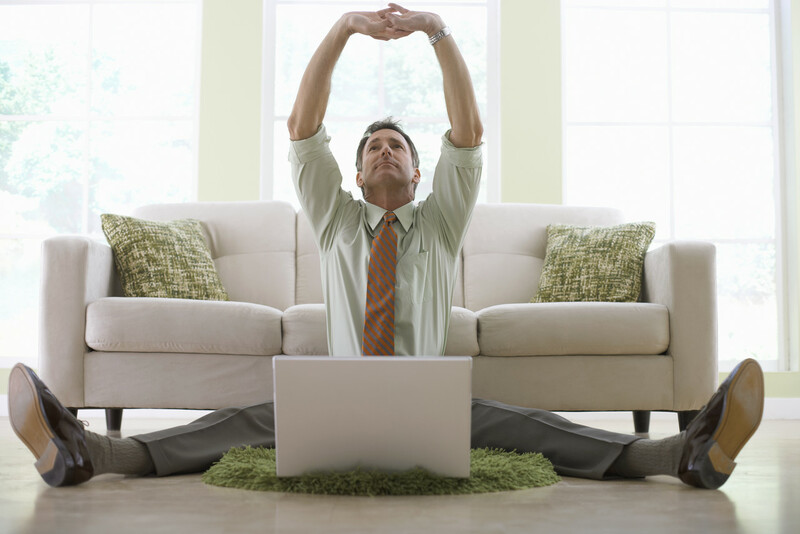 In fact, I can knock out my yoga practice WHILE working! What a FLEXIBLE schedule! Ha, ha, ha, ha, ha, ha, ha, ha, ha, ha, ha, ha, haaaaaaaah, ha!" "With a computer in front of me, and a toy truck in front of Junior, this work from home lifestyle is a cinch! I too prefer the floor, because office chairs are for cubicles! Screw cubicles! This is fun!" The simple act of getting dressed for work gives you a sense of purpose. When you work from home, you throw on the same stinky clothing each day and leave your hair unbrushed. Brushing your teeth might be forgotten too. Ick. Before you know it, you feel like you haven't contributed much good will to yourself or other human beings. Working from home and spending time with your family is a fallacy. Sure, you are already home when you log off your computer and save countless hours being stuck in commuter traffic, but the fact is that your work is ALWAYS there. Companies with a larger telecommuter population work around the clock--emails, requests and deadlines extend to midnight instead of 5pm. Before you know it, you have hardly spent much time with your loved ones because you are at your work computer between waking and sleeping hours. Speaking of having loved ones at home while you are working, there is fault in this too. Interruptions abound while you are trying to focus on a given task. Your home life bleeds into your working life. Your spouse flushes the toilet while you are on a conference call. The list is endless and before you know it, you never relax because your brain is constantly in work mode because you cannot literally leave your work at the end of the day. Or, you think about personal tasks and get caught up in what's going on around you and find it difficult to work. Constant tug-of-war. Lastly, the largest aspect of working strictly from home is the feeling of solitary confinement. I have to hole myself up in the home office to focus on the minutia of my work. My days last anywhere between 8 - 12 hours in front of a computer. Many days, I don't talk to anyone. I listen in on teleconferences, give a brief 3-minute update, or field a random phone inquiry. After two years of working in this type of environment, I've noticed a silent but increasingly alarming change in myself. My level of patience has decreased. My sense of humor diminishes Mon-Fri. My anger (about many things, some trivial) has increased. I cry incessantly about nothing sometimes, and feel very depressed, which ebbs and flows. Sometimes I'm anxious. Sometimes I have insomnia, and sometimes I want to sleep all day. What the hell is wrong with me?!? Suspecting that I need to vary my day more, I remedy the situation by working at a coffee shop (when my schedule allows,) or by joining a group fitness class at the end of the day. These actions help, but do not alleviate. I find that most of the time I go into public, the interaction is minimal and most people keep to themselves. Additionally, there's no way to balance 8-12 hours of solitary time against 1-2 hours of being around others in public. The emotional roller coaster I have been experiencing feels like torture, and I joke with my husband that I liken my work to solitary confinement. He smirks, but inside, I feel this to be true. Is there a difference here? 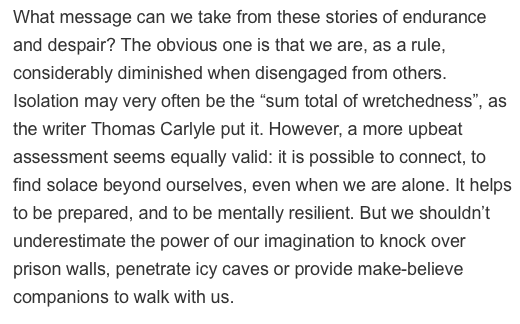 To amuse myself, I took to researching what solitary confinement does to the brain. 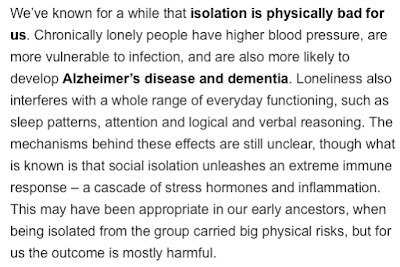 Granted, take this with a grain of salt, because the effects of true solitary confinement would be much more severe than working from home solitarily. This quote from solitarywatch.com rings true. We define ourselves by those in our workplace, our circle of friends, and even the strangers we come into contact with. We learn more about ourselves from others than we do from our own self-exploration. Think about every single time you are with someone, your opinions and thoughts are either validated or challenged. 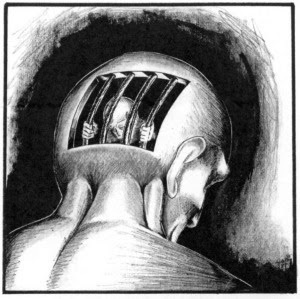 Scientists have further found through animal and human research that solitary confinement has a causal relationship on the structure of the brain, and in fact may degenerate the brain! When a living creature is confined from others, the body experiences difficulty in regulating stress hormones, leading to a dangerous buildup that causes neurons to die in the cerebral cortex. The cerebral cortex is the part of the brain that makes us most "human." 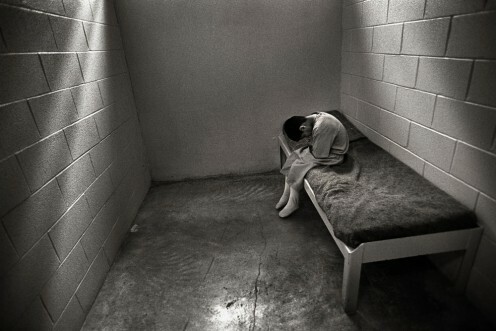 Many released prisoners have reported long-term symptoms of introversion, paranoia, anxiety and depression after release from solitary confinement. It took only a minimum of 3 months of solitary confinement for these adverse effects to kick in. Holy freaking moly! These are symptoms similar to what I've been experiencing over the course of a couple of years (lesser degree of confinement.) Is this a coincidence or am I onto something? An article on braindecoder.com indicates, "Although there's no single agreed-upon definition of solitary confinement, the United Nations describes it as any routine where prisoners are held in small cells for at least 22 hours a day under constant video surveillance. The cramped, concrete cells, often just 6x10 feet, are constantly illuminated by fluorescent light and contain a bed, sink, toilet, and not much else. Except for prison guards, inmates are intentionally deprived of other people and stimuli, including television, radio, and perhaps no more than a few books." Working from home is described as a routine where employees conduct work in their home (of varying sizes, often equal to or larger than 6x10 feet) for at least 8 hours a day under constant email surveillance. 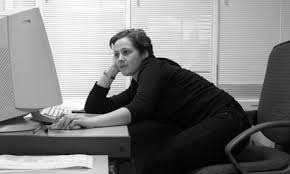 The home office is generally set-up according to the the employee's liking, though requires a desk, sink, toilet, and the constant use of a computer, deprived of other stimuli. No doubt my research of this subject matter has raised ethical questions with our incarceration practices, (such as the chicken or the egg subject-matter on mental illness vs. the effects of solitary confinement for ex-cons integrating back into society.) Additionally, this research can be lightly compared to lifestyles where people choose--or don't choose--lifestyles that contribute to feelings of loneliness. 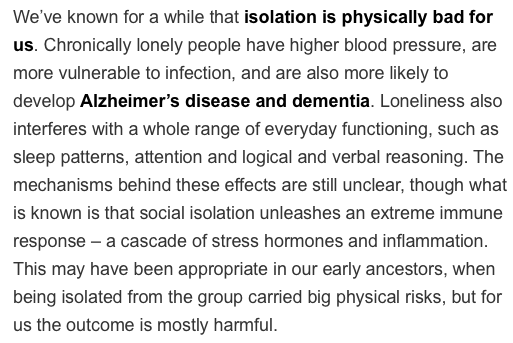 A bbc.com article reports the ill effects of loneliness, excerpt captured below, in which I further believe our modern lifestyle puts us into the lonely category. Facebook, cell phones, telecommuting...all done alone. Could it be possible that the increase in mental illness statistics directly correlate with technology's influence to a more solitary lifestyle? Can the new employer telecommuter model actually cause more problems with our emotional health? I'd love to hear from others who work from home--what types of internal changes that have occurred (if any) or how to cope with the lack of human contact and stimulus. We have been lucky this summer season in Texas. What is normally 5-6 months of 90-100 degree temperatures has been shortened to 3 months. Now that it's starting to heat up, the idea of wearing clothes in general doesn't sound fun. I've always been in favor of the winter season because I love scarves, jackets and layering. My creativity for getting dressed seems to fizzle out in higher the temps. I find summer clothing completely boring! Shorts and tank tops? Same old summer dress? Meh. How can I solve the problem of looking chic while staying cool? (Sometimes it's too hot to wear a hat, blazer or even cuff bracelets.) I've put together my own list of jazzy, lightweight items to wear when hot, to make you look hot but not feel hot. Kimonos seem to fall in and out of style each year. 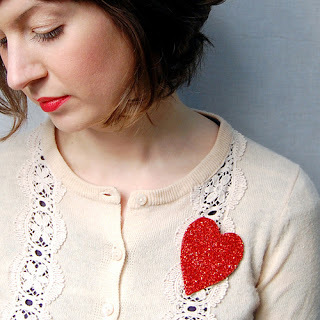 I personally think if you buy a classic print and cut, you are always in style no matter what fashion-mongers dictate. Leave it to fashion icon Nicole Richie to pick out a classically styled lightweight kimono. The sheerness allows breathability and the length will protect your skin from the sun's harsh rays. I like to partake in this look when I travel, because lightweight scarves take up the least amount of suitcase space and offer the greatest amount of versatility. 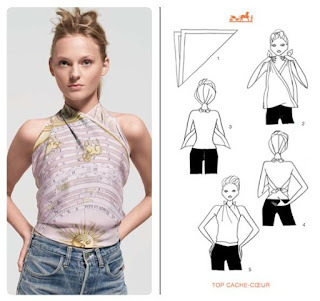 When tying a scarf into a shirt, all you have to wear beneath it is a tube top (or go commando). Easy breezy. With so much versatility and color, there is no way to get bored or sweaty with this clothing staple. Photos via veryverve.com Hermes knotting cards. 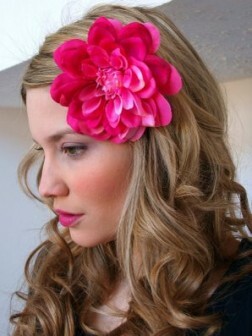 Hats can be hot, but hair bling, depending how it is constructed and worn, is relatively cool in hot weather. There are a potpourri of options out there. Find something that works with your current haircut and taste. Don't be afraid to wear something daring. ...And go versatile. 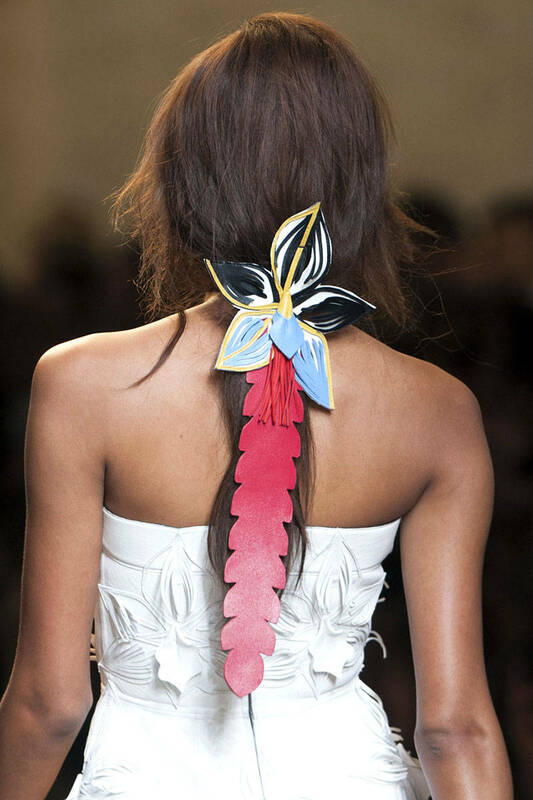 Hairpieces are not just for hair. Clip them to your tops to transform the look, as shown here by Giant Dwarf. 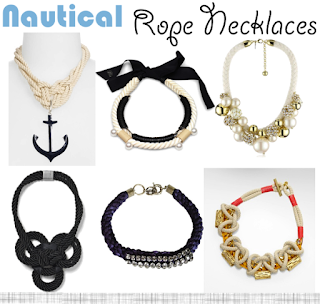 I love the look of rope in many forms on the body, above or below the waist. 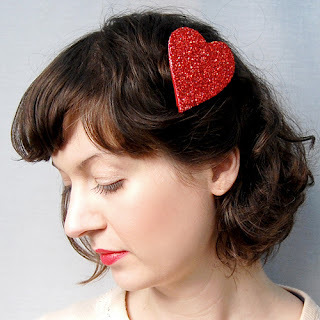 Needless to say, it is a pretty inexpensive purchase at your local home furnishings or craft store, to make your own adornment. 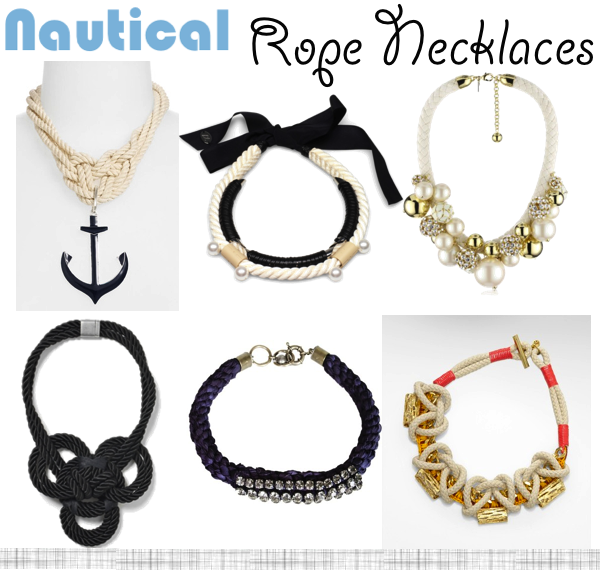 From head to toe, rope evokes summertime ease. Photos via Glitterinc.com, Pinterest.com, and whollykao.com, respectively. Share with me any ideas you have run across that are interesting yet cool during hot summer days. As someone who is self-diagnosed with Interest-related ADD, I intend to share the random fascination of the hour, day, week, or month.